Doug Keenan, the statistician whose work highlighted severe flaws in the work of the Climatic Research Unit at East Anglia, has welcomed the Sunshine order to open up the station records. Scientists need the raw data to replicate temperature records, but CRU refused to release the data requested - a subset of weather station records from around the world - to a top UK Oxford physicist, despite having already shared the data with Georgia Tech in the United States. The ICO comprehensively demolished the reasons CRU offered - including intellectual property and fear of jeopardising international relations. In doing so, it's raised the standard for academics working across all UK sciences. "The ICO's Decision Notice is an extremely well-reasoned work, with rigorous logic," Keenan said. "They did similarly with the Decision Notice for my FoI request for the Belfast tree-ring data. "Of course I am glad about the decisions that the ICO reaches, but more than that, the logicality of the arguments is strongly impressive." It's a surprisingly aggressive ruling, in that it acknowledges the IP rights of owner of a database - but says that there is a greater public duty to disclose the data. "Some of UEA's claims are absurd, for example, that the requested data was publicly available," Keenan told us. "It is clear, then, that UEA is trying to find some excuse to prevent disclosure of the data. "What, then, is their real reason for not wanting disclosure? If UEA is truly interested in advancing scientific understanding, why do they not want to make their data available to others?" Reader comments on the story have produced some fascinating responses: lifelong anti-copyright zealots can be found explaining the benefits of copyright, and veteran "open data" crusaders advocating data be kept under wraps. Climate debates can do strange things, with cherished principles being jettisoned - the means apparently justifying the ends. Keenan says he wasn't impressed by the support for the CRU academics from the new warmist president of the Royal Society, Paul Nurse. At a recent meeting, Keenan took issue with Paul Nurse's claim that CRU academics felt "bombarded" with FoI requests. "I stated that the claim was false, and gave a summary history of what had actually happened. Nurse replied that if scientists felt that they were being bombarded, then the scientists were being bombarded. "Nurse is plainly being illogical. He seems to believe that scientists always have honorable motivations - including when refusing to disclose data. The ICO Decision Notice provides further evidence that such a belief is unrealistic." It's not the finest hour for the Royal Society which advanced the scientific method from its foundation in 1660. 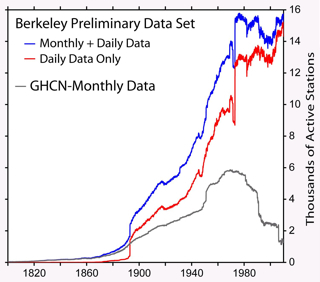 On a more positive note, Keenan welcomes the BEST Project in Berkeley, California, an exercise to produce a reliable temperature record with more complete data than the world's largest data set, the GHCN (Global Historical Climatology Network) record maintained by the US National Climatic Data Center. 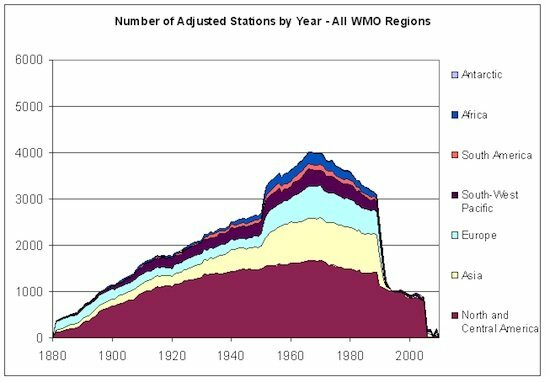 A large number of station records outside the United States were removed between 1988 and 1992, resulting in more interpolation. Critics say this cooled the 20th Century temperature record.